Since she left her psychiatric practice in New York City to open up a psychic shop in her hometown on Long Island, Cass Donovan has given her fair share of readings to conflicted customers. But what she sees in Ellie Hawkins’ future doesn’t bode well. When Ellie’s mother Marge publicly confronts Cass about the reading, the embarrassment makes her want to curl up and die. But when she later stumbles across Marge’s body—and is arrested for her murder—Cass is suddenly the star of Bay Island’s rumor mill. 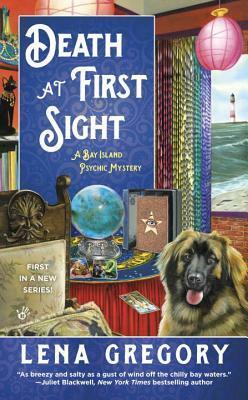 Book #1 in the Bay Island Psychic mystery series. This paranormal cozy mystery was really mostly cozy, with just a touch of paranormal, but that was fine with me. I loved the protagonist, Cass. She and her friends were very well developed, and felt like a group of people I’d like to get to know. The mystery itself was well written and full of surprises. It took me a few chapters to get really sucked in, but once I did, I couldn’t put it down. This was a great way to start a series – I’ll be watching for book #2! Be sure to enter the Rafflecopter giveaway for your chance to win either a print (US only)) or ebook copy of Death at First Sight! NOTE: I voluntary read and reviewed an advanced copy. Next > The Case of the Missing Morris Dancer – Guest Post and Giveaway! I’m looking forward to reading this book. It’s just what I like. I sure did – thanks for stopping by Lena! This sounds like a great start to a new series. I can’t wait to read about the Cass’ psychic abilities. Interesting review. Have to try it.